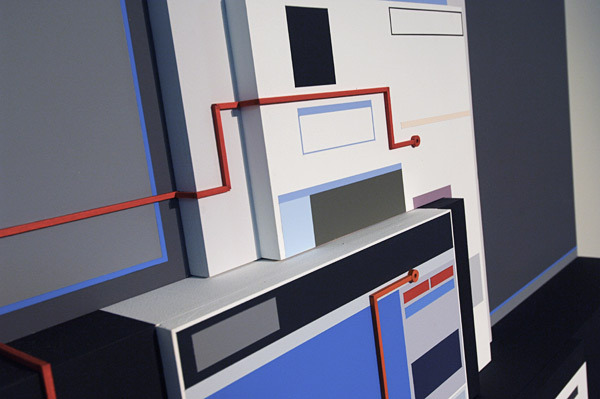 A recipient of the Illinois Arts Council Fellowship Award, Nancy Bechtol is an internationally exhibited, multi-media artist who creates stream-of-consciousness themed electronic paintings, video, installations and photography. A self-avowed urbanite, Bechtol employs her art as a tool for transcending the discord of disillusionment often found in the metropolitan landscape; providing inspirational revelations through creative imagery–offering opportunities for evolutionary change. Hi Nancy, welcome to AD Mag! It’s a pleasure to be in Cyberspace with you Max Eternity. Btw, you have a great name. It makes me feel like changing my name to something more dynamic and artsy. As it is said: Art is long…life is short. So tell us a little about yourself. Where’d you grow up? Where are you from? Chicago. And yes, right in the city; in a neighborhood of Logan Square. I’m an urban gal, love the city and all the diversity of life. And how long have you been an artist? I would say, all my life. Early recall is of always making something; imagining things that did not exist. Seeing animals and things in clouds, yes I have been good at that forever. I appear to be wired that way. Well…never let reality stand in the way of imagination. Guess you could say I got ‘more intense’ after getting my MFA from The School of the Art Institute of Chicago. That seems to be when the label ‘artist’ became firmly planted. 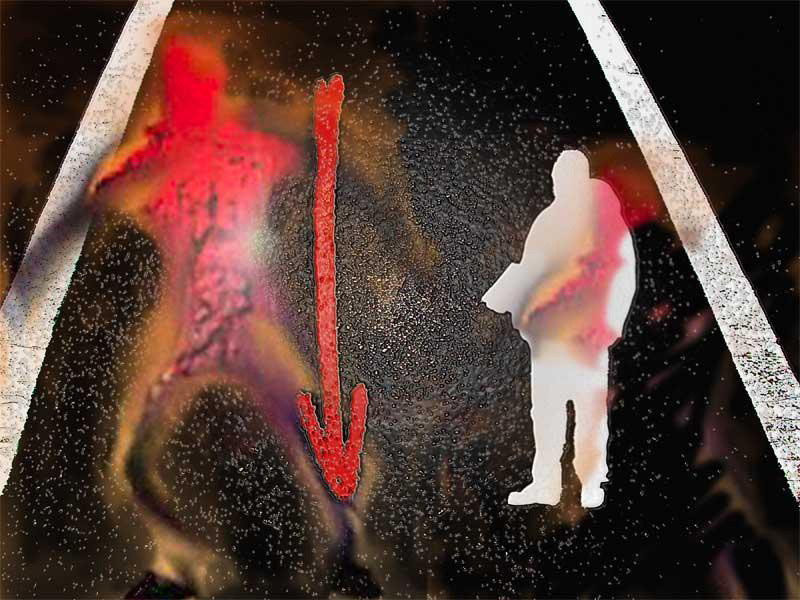 Mostly what I’ve seen of your work consists of photographs and figural digital paintings. Do you work in any other medium(s)? Lee is an artist, poet and performance guy. He is in the Guinness book of Records for a Movie he starred in the mid 80s which is 85 hours long; based on a poem he wrote which is about 6,000 pages. He beat out Andy Warhol for the record. So first, let’s talk about these crazy faces that you create. 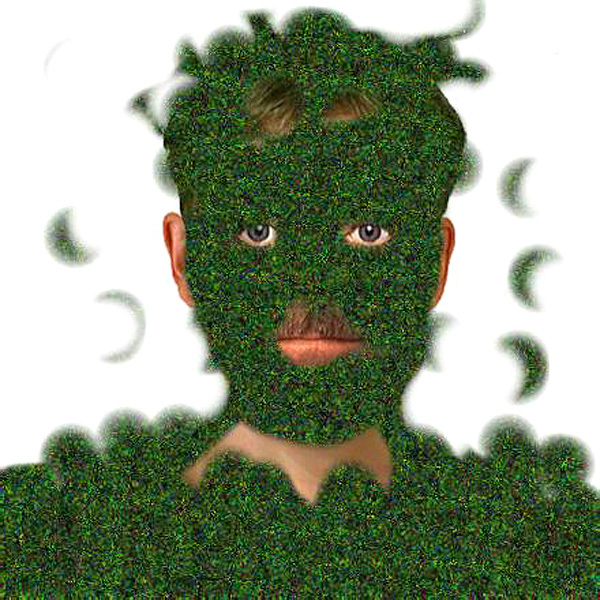 You have a few posted to your website, but I especially like the person who’s got grass growing on their face and shoulders. I don’t know why, but David Lynch just popped into my mind? Your linking of my mindset with David Lynch is a keen observation–an honor. I am a fan both of his movies and of his purpose in life. I love the fact he has created the David Lynch Foundation for the consciousness-based Education and World Peace. He aims to transform lives of at-risk youth through transcendental meditation. I do breathing and walking meditation, but someday, hope to train in TM. I am a lover of surrealism and heightened awareness that engage people. Playing with the multiple meanings and visual dialogue gathered from the viewer is very cool. 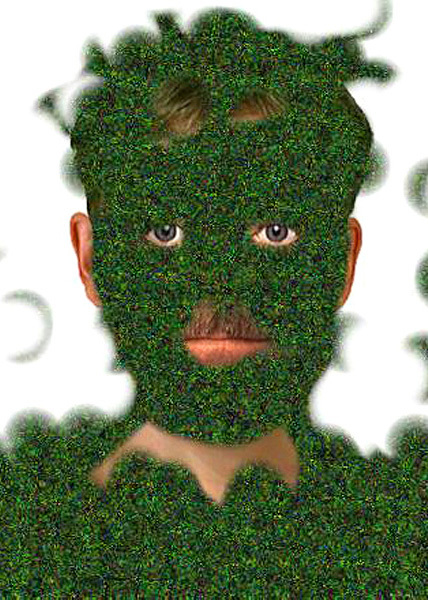 The grass man is one with nature in many ways. What you say, who you are, what you do. Here it is personified. Freaks, is a term of endearment to me. There is no pretense there. It just is. That’s a thought; interesting. Too, you also talk of walking in relation to meditation. Yes, the act of walking is great. And in a walking meditation one has the conscious awareness of your body; every step, how your feet contact and leave the ground…a beautiful thing. As far as TM – Transcendental Meditation goes, I am a very much newbie at the understanding this discipline, but it seems to engage my interest. TM is a disciplined course in meditation which became known to the [Western] world by Maharishi Mahesh Yogi. It [became] most popular when The Beatles traveled to India, and were taught by him. Their music that followed reflected that energy. I believe wise people learn from others who have found the way. I appreciate those positive thoughts and believe it is good to learn from the universal power from all cultures and spiritual beliefs which aim for the higher good for all. 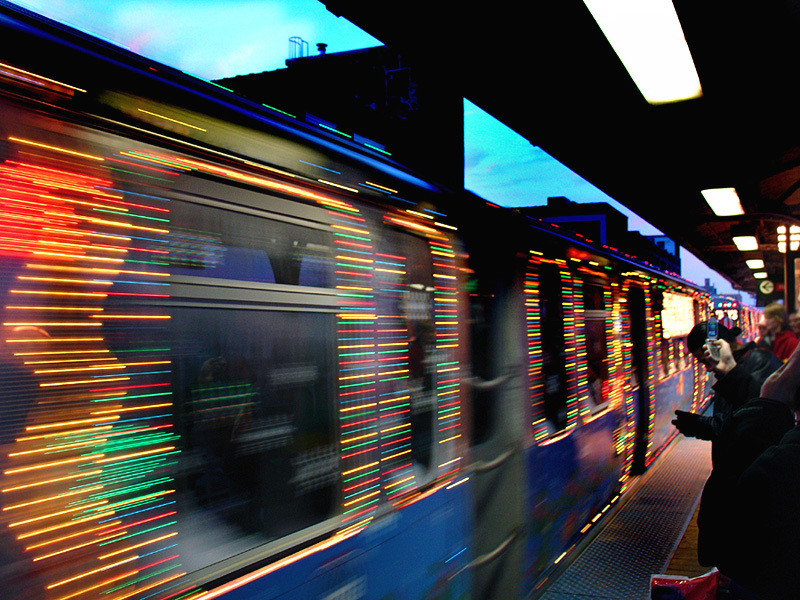 So, I was just looking at a piece on your absolutearts.com site called “Train holiDaze.” It’s a photo of some people standing on a train platform as the subway arrives. Nothing unusual about that, and yet you’ve made an ordinary image rather surreal. The most obvious thing is the sort of blurred lighting coming from the train, but there’s also the white-striped lights on the ceiling of the platform, which against the black ceiling, creates the illusion of there being a street hovering upside-down over the platform. You have keyed in on one of my “themes” quite well; making the ordinary image into a surreal experience. Thoughts translate to vision. Some are quite trippy. Whatever that ‘thing’ is, it seems to me that every person, place or thing emits vibrations, which tell inner stories. I observe and the vision flows. Your thinking, your art, and even your speech pattern…it again, all reminds me of David Lynch. Yet, sticking with the theme of urban life and the streets, as it were, I came across another piece of yours called “Streetwired Get Down” that appears to be a part of a running series falling under the “Streetwired” name. Could you talk about Streetwired? 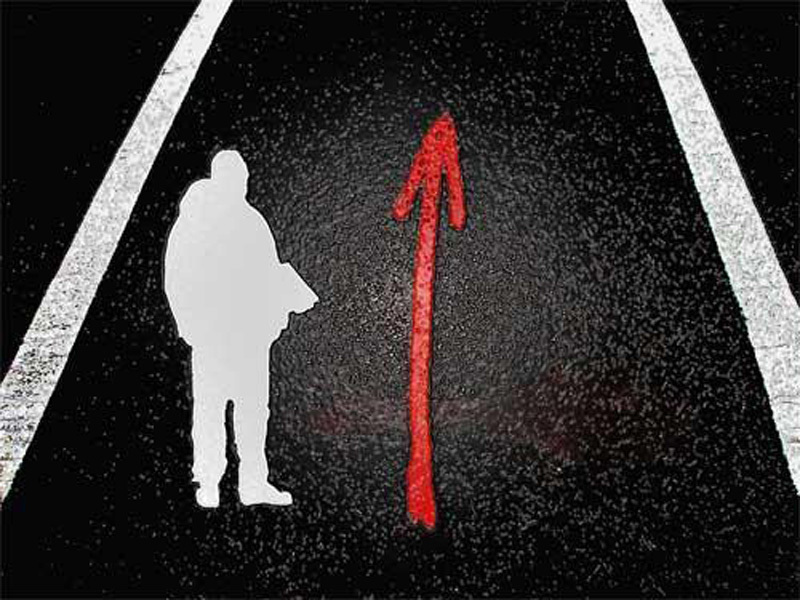 I am glad you asked about this one, I consider the 2 versions of “Streetwired” to be personally very significant works. It involved my conceptualization and collaboration with the vendors in performance–installation art–art photos–video, and a live Streetwire Vendor participating in the art with conversation, or their own art. StreetWise is an Organization with a mission to “empower men and women who are homeless or at risk. As they work towards gainful employment, they sell the paper the organization makes; as a job. 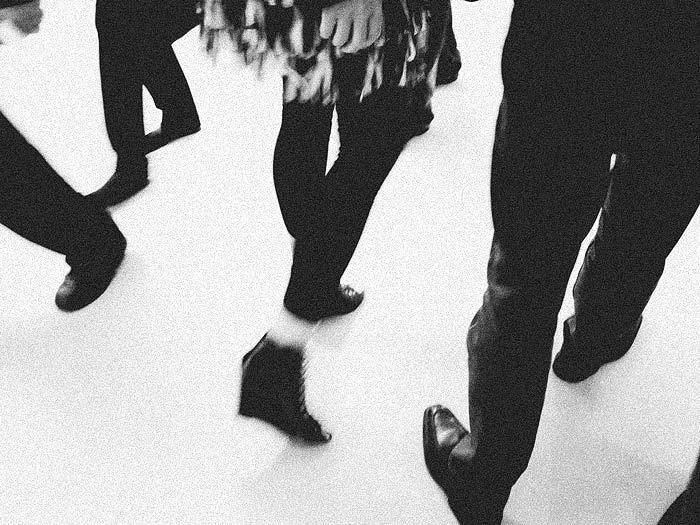 The 2 socio-political installation events aimed at joining of art and social issues, aiming to direct the viewer—to think about things and people we discard/disregard in society and our daily lives. It brought art patrons in touch with a homeless person in a gallery setting to engage in a more one to one human interaction; in a relaxed setting rather the normal engagement on the street where they sold the paper for a living . The first one was in 1998 called “Streetwise/Streetwire.” The live element of the actual person selling the Streetwise newspaper surprised many—as you may imagine–such a mix of reaction from engaging in unlikely conversations, to ignoring the installation or walking across the room to avoid it. I hired the vendors for their performance in the art, and they also “sold-out” their paper! There was a collection of old wires I found on the streets that had text connected like: “once useful, no longer needed.” Then, In 2005, Roark E. Moody, a poet who is still a vendor, and now living in temporary housing, was my collaborator. I found him by chance. His poems were placed on large printouts in the installation, along with my video conversation telling a bit about his life and art. It was a very emotionally satisfying work, and Roark was actively engaged with the art visitors; in conversation about his poems. I am still moved by this collaborative installation and many good things happened because of it. I have kept a connection with Roark. I visit him at his vendor location which is [in] downtown Chicago. An amazing thing happened, which was profoundly moving. Roark’s son found my web posting of the show and videos of his dad. They reconnected after a very long time; now seeing each other often. This is the healing power of art. 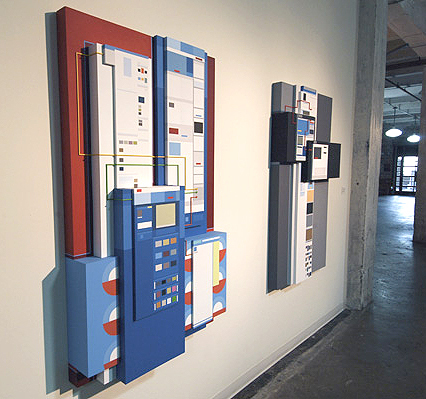 Both of these installations were shown at the ARC Gallery in Chicago. Very fascinating…with a wonderful human element. It’s apparent that you love the city. But obviously you don’t just take pictures of cold brick and glass facades. You seek the humanity, bringing a certain cognition to light. I think this often gets missed when someone is tries to capture the “ordinary” experiences in life. Ordinary doesn’t have to mean dull, you work really proves that. For instance, there’s a couple of pictures that have to be mentioned; the ones in the snow. There’s the aptly titled “Snow Barn” and then there’s the picture of the two little dogs frolicking in the snow, called “Chloe Chases Dylan.” I like both those pieces. And by the way, have you ever seen the work of David Winston? I ask because the trees in “Snow Barn” remind me so much of all the beautiful trees that he’s known for capturing on film. As you ask about these snow images, I become very aware of the strange range of my visions. This allows me some reflection, which is good. Thanks for that Max. I often work in “series”, so I stay true to the intentions of the images. But there is that ‘perfect moment’ which just shouts out. The joy and serenity in these images appeared most suddenly to me. 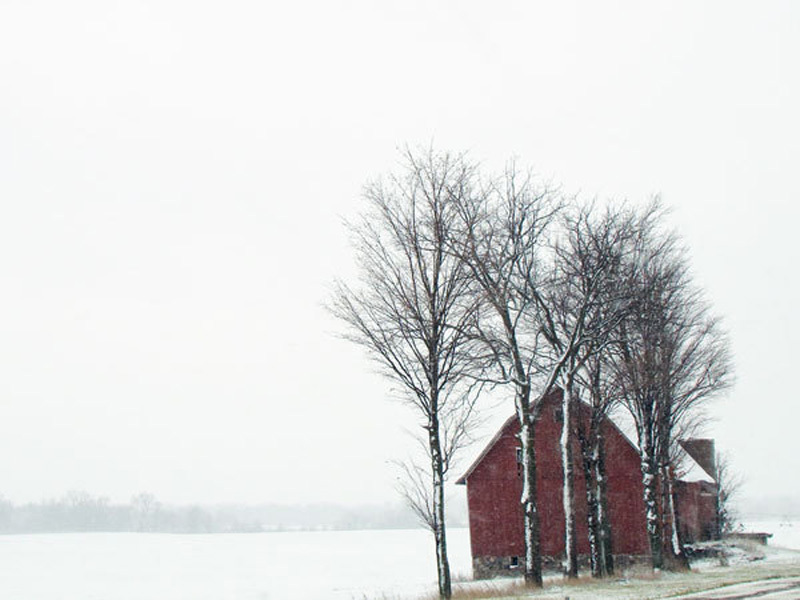 Leaving the City, and driving up to Michigan to visit my husband, David’s family, the barn appeared like none I had ever seen before—like the first real barn I had ever seen. 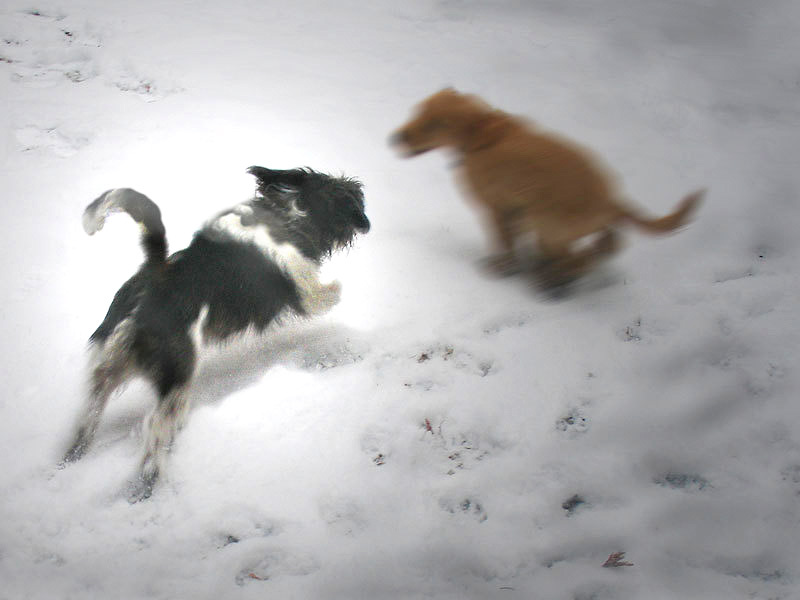 Again, in the moment of a first heavy snow, our dog Chloe, was visited by the young pup next door, Dylan (named after Bob) came by –I ran in and grabbed the camera to capture the joy and energy. I am always open to learning, and seeing new things! Thanks for sending me on a web search. Winston’s work is beautiful and inspiring. We have to close now, but I must say, of all that I’ve seen on your site, there’s a photograph of (from what I can tell) some blurry lights. It’s called “On the horizon is more”. It’s very simple, but it really speaks to something profound….I’m not sure what? As you see the profound in the simple, you see very, very well. This series comes from the “Light Ride Series” started in 2007 and continuing [on]. 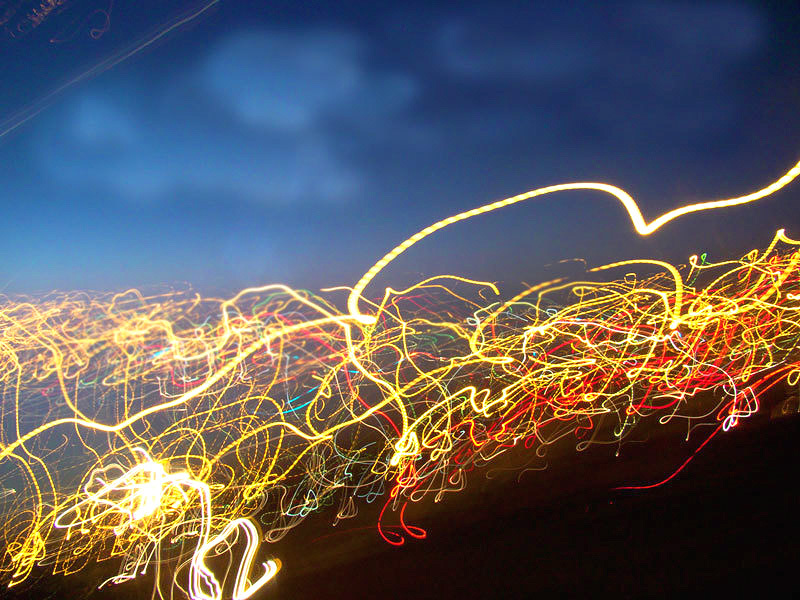 The technique is a simple one; long exposures with car motion and ‘light drawing’ with the camera. At first I was very ‘literal’ to get the technique to my liking. As I progressed, I was intuitively moving and changing settings; flowing with the colors, lights, motion, trance- like. I have made about 200 so far. There is always-more on the horizon. Nancy, thank you so much for taking the time to chat with me. Max, thanks so very much for allowing me to reflect upon my art and share my inner thoughts with others. Your insightful vision is a gift and much appreciated. 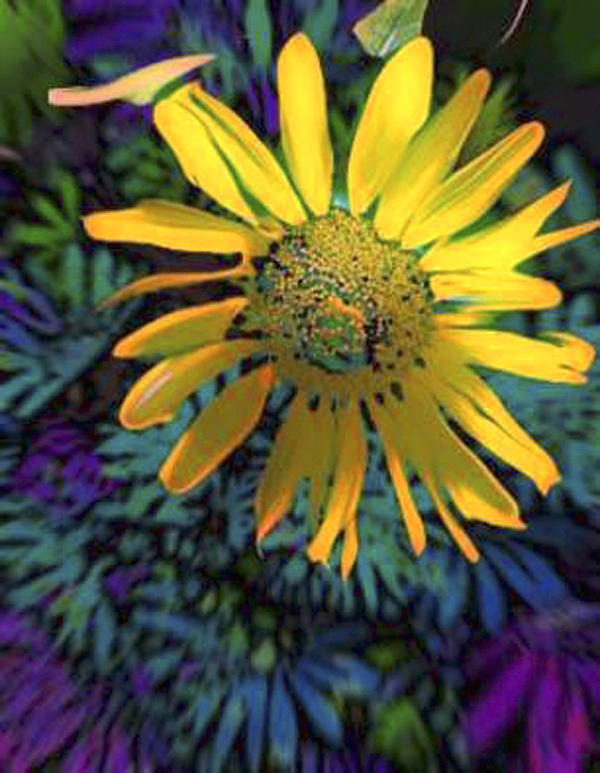 Visit Bechtol’s website here, and view more art in the artist galleries here. As well, be sure to check out the full archive of AD Mag artist’s interviews here. Hello Brian, welcome to AD Mag. Hi Max. Thanks for having me. First let me say, I love the name of your website—Spill Some Paint. Clever, where’d the name come from? I registered the domain name back in 2001, long before I turned my attention towards digital art, but I feel the spirit of the site’s name can be applied to all artistic endeavors; that, and I still think it’s cool. And speaking of websites, from what I’ve observed, much of your work draws from the Internet and interactivity with websites. Yes? Yes, you are correct. Most of my work over the past four-plus years is derived directly from the Internet. In addition to working from individual web pages, I’m also interested in exploring site structure, the user experience, and Internet-specific nomenclature and artifacts. I became fascinated with HTML and the Web while at college in the late 1990s. After graduation, I worked for a web design company for several years before eventually returning to school for my MFA. In grad school I tapped into my professional experience for inspiration and began creating web-based abstractions. 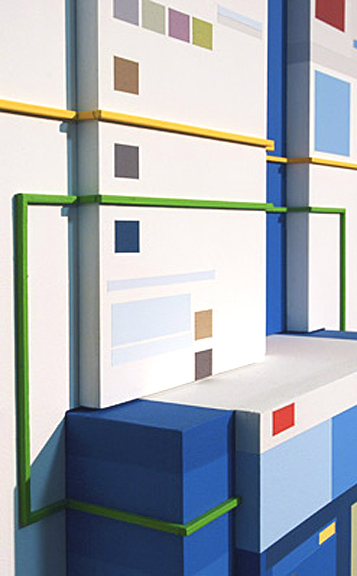 The earliest works involved taking a screen capture of a site and reducing its content into a geometric color field. Essentially, the site’s text was removed and all images were replaced with blocks of representative colors. Later works become more complex, often incorporating a site’s information architecture or a user’s clickable path. Mrs. Clinton at Work in Washington, for example, shows the homepage abstraction of the then-Senator’s official site above a diagram of all linked content from that single page. You write in your artist statement, if I may quote you, “The Internet’s dynamic nature at large.” Could you talk more about that? I mean, is this to suggest that the Internet exists beyond the utility of providing data? First, let me say that I think it absolutely exists beyond merely providing data. Think of how Amazon and eBay have changed the retail landscape, for example. Suddenly anyone can sell anything to anyone else anywhere in the world. More recently, look at the rise of social networking sites such as MySpace, Facebook, and Twitter. Now people who don’t know the first thing about building a webpage can easily establish and maintain an online identity. The Web has moved from being largely a spectator sport to being a participatory one. Even websites for news outlets such as CNN and your local paper have promoted user interaction through the use of story comments, blogs, and forums. The Internet is a very different place than it was ten years ago. It is this inherent lack of stasis I was referring to with my comment on the Internet’s dynamic nature. Websites are meant to change. New content is constantly being added while older material is being replaced. On a larger scale, technological innovation compels companies and organizations to evolve their web presence. Even the most established sites get redesigned or re-launched every couple of years. Having gone through an art program that paired digital media with photography, I often joke with viewers that I have “photographic tendencies”. I think there’s some truth in this. Due to the fact that my web abstractions, like photographs, are captured moments in time. Looking back, almost every website from which I’ve created work no longer exists in that same visual manner or structure. TomDeLay.com, for example, was the personal campaign site for the then-Majority Leader in 2005; used in my piece “The Rise to Power of Tom DeLay”. Today that website still exists, but with a completely different purpose…to promote the embattled politician’s upcoming appearance on Dancing with the Stars. [Max laughing] Yes, it would appear so. Too, I can tell that you’ve spent a lot of time thinking about this—great observations. As well, now that you put it that way, I would definitely have to agree. The internet has become much more participatory. And yet, it’s still comes from a unique approach to think of it as being used as a building block for art. Although, another artist that I’ve gotten to know in the last year, Chris Ashley, seems to have a similar idea when it comes to HTML and art. Like HTML, are you suggesting with “Spill Some Paint” as your motto (if that’s the right word) that anything can essentially function as paint–that paint is more than just paint? Chris Ashley’s HTML drawings are great! I think they’re very, very fun, particularly once you understand how they’re made. As far as “Spill Some Paint”, I don’t want to get into a discussion on what paint is, because I’m not an educated painter and it’s not my place to say. I just think “Spill Some Paint” is a nice metaphor for “making new work”, regardless of your specific artistic tools. By the way, I love your sculptures. I really like the pieces with Obama and McCain in the titles. The pieces have a real retro-futuristic look. Yet, technically speaking, how are they done. Are you using rapid prototyping…laser cutting? Thanks. I’m really pleased with how they came out. Laser cutting would have been awesome! I certainly need to research that for next time, but these pieces were crafted by hand, using various types of plywood. Most of the big cutting was done in my father’s garage, and then I pieced the smaller blocks together and primed and painted them individually in my studio before combining the elements. There was lots of wood glue and screws involved. For the painting (on these pieces and elsewhere), I tape off each area, apply a thin layer of gel medium to control bleeds, and then roll several coats of paint over that. The paint itself is latex-based interior house paint, which I started using with my wall paintings. You created an animation called “Homeland Security.” And in light of Tom Ridge’s new book, Ridge being the former director of that organization, having just hit bookstores, talk about that piece; if possible, tying it in to what’s happening with Ridge today. The piece consists of juxtaposed animations created from the site map for the Homeland Security website. 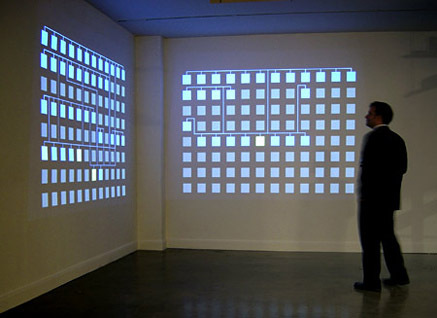 There is a grid of 96 rectangles representing the 96 pages on the site at that time, and each frame shows a given page’s connections with the other pages within the site. All 96 pages existed in the same folder on their server, which from a web designer’s perspective, is organizational chaos. One animation quickly and randomly cycles through the 96 screens while the other very deliberately and calmly goes through them in sequence. At the time, Homeland Security was falling under heavy criticism, and I offered up the two animations as different views of the organization. one being chaos [another] being order. The funny part of this piece is that while I was working on mapping the site out, they re-launched the website with a brand new design and an actual folder structure. 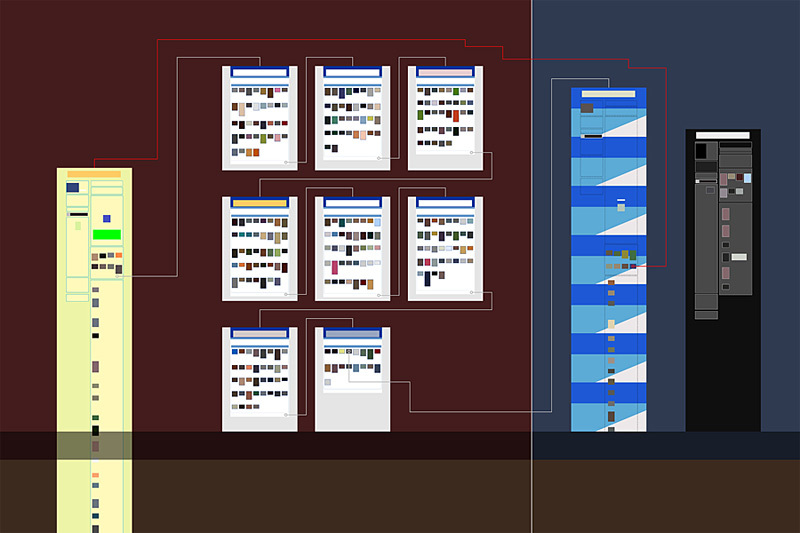 My goal was to create a piece based on the site’s lack of organization, so to have the web site suddenly show dramatic improvement in its organization in the midst of my research was inconvenient, to say the least. Luckily, I was able to use an Internet archive tool (the Wayback Machine) to complete the mapping of the earlier site, which suddenly no longer existed. Also, talking earlier about works made as commentary about Mrs. Clinton and Tom Delay, I also noticed you created another piece, which pertains to President Obama; a digital print called “Barack’s Twitter.” That said, it would seem that politics interest you. Has that always been the case, or is this a situation where, as with so many young people in the last election cycle, you became interested as a result of the Obama effect? I think it’s always been the case. Compelling personalities and stories interest me, and politics has always offered a steady supply of those. I also want to believe that political figures are better known to the general public and, as such, offer an entry point into my work that other personalities or topics would not. So there is a certain strategy at play in the political pieces. This past election was a historic one on several fronts, and the sculptures you referred to were indeed created as a response to that event. It was easy to get swept up in the election because it felt so new. It was unlike anything this nation had experienced before. The run up to the election was extremely exciting, and I was compelled to make new work about it. The sculptural pieces are less about the individual candidates, however, and more about how the two campaigns were using the wide reach of online social media sites; a Presidential election first. Changing topics…Lawndale, how did it come about? And as well, though the title of the piece obviously speaks to the nomenclature of the venue, why use such a title? Was this piece based on some computational function? Lawndale Has Many Friends was a site-specific installation at Lawndale Art Center, a non-profit alternative space in Houston. 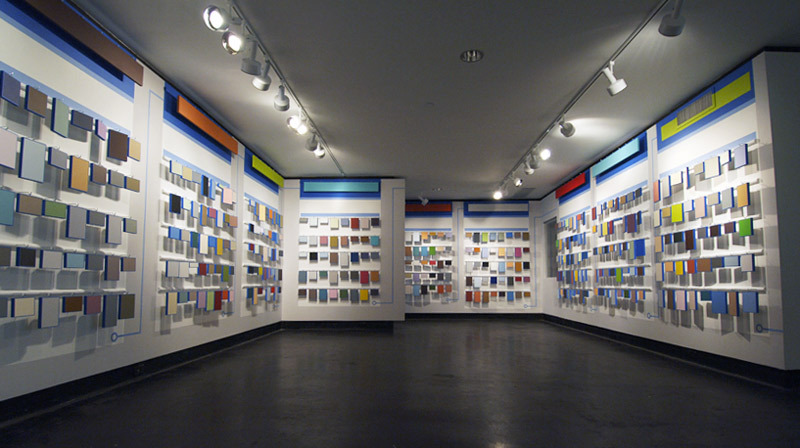 The center (like countless organizations) uses online social networking sites to promote itself and its exhibitions, and this piece was a large-scale abstraction of the “Friends” section of Lawndale’s own MySpace page. 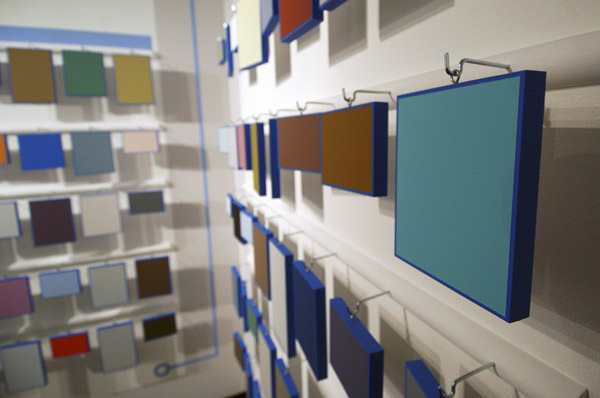 The walls were painted floor to ceiling, with thirteen connected “Page” templates painted throughout the gallery and over 560 individually-painted blocks hanging offset from the walls. 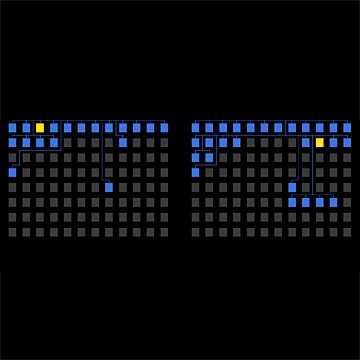 Each block was a single-color abstraction of a single friend’s avatar image, trimmed in blue (a design element used by MySpace which has since been dropped). I chose to render these icons as wood blocks because it would allow me to rearrange the order throughout the six-week exhibition. There is no stasis on the MySpace website, so I attempted to emulate this constant activity by adding new friend icons to the gallery about once a week, thus rearranging the order of icons among the thirteen pages. Regarding the title, it actually comes from MySpace nomenclature. Every profile has a friend counter, which is presented as “[profile name] has [number] friends”. I didn’t want to use a specific number, however, because that variable could change so quickly. For example, at the time of my proposal, Lawndale had 509 friends indexed over thirteen Friends pages. By start of production, that number had climbed to 571, and by the exhibition opening it was over 750. (Incidentally, two years later, Lawndale now has over 1,100 friends.) So, although unspecific, Lawndale Has Many Friends captures the essence of the piece, both in number and in concept. It was not the individual identity of these friends that was important to me, but the quantity. My hope was that any visitor to the gallery would appreciate that there was such a large number (560) of individuals represented. Lawndale Has Many Friends was a huge undertaking, and I had a tremendous amount of help along the way. The project was documented – from the original proposal to final exhibition – via blog entries on its own MySpace page. This piece was a milestone for my art, as it gave me the confidence and experience to make the sculptural pieces that followed. There are other large ideas, beyond the internet, that are emerging though not being fully noted. Particularly as it relates to art, I’ve noticed that by and large almost all art these days gets classified as contemporary. But once upon a time that was not the case. Each particular style used to have a different name, and was well articulated by the artist of said set. It used to be the modernists, the Dada, pop art, the Fauvist, surreal, etc., etc. Now, it’s just one big lump…contemporary. But in my own way, I’ve tried to expand the dialogue in this respect, coining a term I call TADAE. It stands for Traditional And Digital Artist-Engineer. You’re a perfect example of this; someone who creates both digital and traditional art that melds together seamlessly. Any thoughts here? I think time will be the ultimate decider on whether any subset classification of “contemporary art” will stick, but I like that you’re trying to establish a more specific category within digital art. I would have to agree that I fit into your definition of TADAE since I often pull my digital creations out of the computer and render them with traditional media. I am of course not alone in this practice. I know of many painters who use digital software to work out ideas and compositions before ever grabbing a brush. 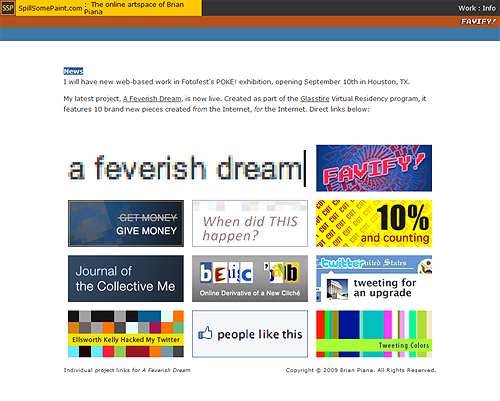 Yet the subject of my work is also inherently digital; being from the Internet. So whether I choose to create a print, a painting, a sculpture, or an installation, the work itself has digital origins, which perhaps is what places the work into your TADAE category. I must say I’m most intrigued by your classification because it might be able to introduce me to other artists working in the same formal or conceptual vein. I’m always interested in seeing what else is being done within my area. You’re not just an artist, you’re also a teacher—professor? Yes, I am a professor in Art and Visual Communications at the South campus of San Jacinto College in Houston. The students are a blend of those wanting to pursue the Arts and those wanting to enter the design industry, so my experience from both realms comes into play on a near daily basis. I love working in academia. It keeps me inspired and on my toes. Students are being introduced to creative software earlier and earlier in their education, which is pushing me to keep up with the curve in terms of software and techniques. Come late September, in Artworks Magazine, I have an article about digital editions that will be published. It’s a reality that’s never far from my mind. So I would be curious to know where you think we are today, in the marketplace of ideas and literally in the marketplace of commerce. And how might this tell of our digital future? I have to be honest and say I do my best not to think about digital editions. How’s that for dodging the question? There are some specific issues with them, which you begin to address in your [paper] “Collecting Digital Prints”; such as naming convention, time of creation vs. time of print, etc. One of the reasons I’ve moved more into painting and sculpture lately (besides flexibility in scale) is that it sidesteps the issue of digital editions altogether. That being said, as a consumer I love the value of a digital print versus a one-of-a-kind original work of art. So I imagine I will return to making printed editions at some point…That, and it’s quicker and cheaper than hand crafting and painting a 6’ sculpture! Brian thanks so much for taking the time for this chat. Good luck in all your endeavors. Thanks, Max. It was my pleasure. Visit Brian Piana’s website here. See more art in the artist galleries here, and be sure to check out the full archive of AD Mag artist’s interviews here.